Skills and tips - Suscram. This should be used for going down hills. This position is used for when you are going down any sort of hill anything from a small angle of a hill to a nearly 90 degree angle. To do this skill properly stand up, bend your arms and legs and put your weight slightly over the back of the bike by putting your bum slightly over the back of the bike seat. Keep your pedals even. You must remember to be fluent and relaxed: do not put yourself in the knees and arms bent position and lock these areas out as you want them to absorb bumps. It will help you to keep control and give you the confidence to go faster, almost like you have 2 suspension systems when riding your bike. This is a very useful technique to have when going out on the trails. This will help you to be able to corner at faster speeds once you have this technique sorted at lower speeds. To do this you must approach the corner at a speed you are comfortable with, braking before the corner rather than on the corner. Try to apply your brakes evenly to avoid skidding. Let the bike take you around the corner – being in the correct position will help you avoid skidding. If you are turning right, bring your right foot up and push hard down on your left. Keeping upright, lean the bike, not you, into the corner and try to accelerate out of the corner. If turning left, do the opposite with your feet. Once you are more confident you can then take the corners at higher speeds. There are different routes when you are at trails and we are going to show you the difference between a moderate course, Blue, and a difficult course, Red. 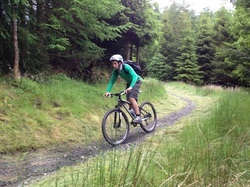 This course is suitable for riders with good health with basic off-road riding skills. The rider should have a basic mountain bike. The trail will include some single track sections and small obstacles, such as roots and rocks. 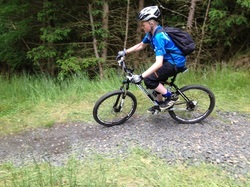 This course will be suitable for proficient mountain bikers with good off-road riding skills and fitness. The rider should have a good mountain bike. The trail will include challenging climbs, tricky descents and technical features, such as drop-offs and large rocks.